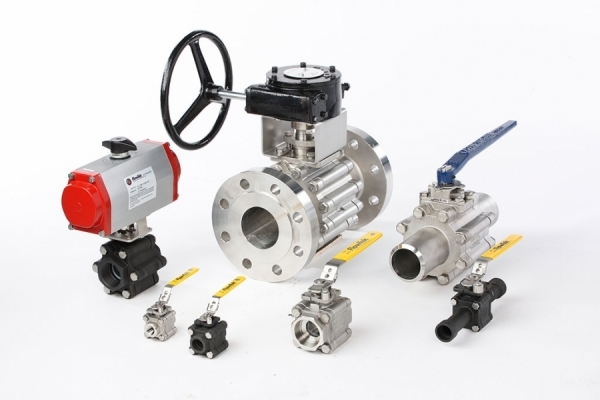 Flow-Tek’s Triad Series ball valves feature live loaded stem seals and a redundant body seal design. 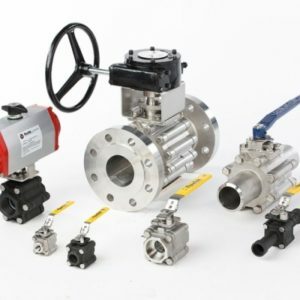 Available in full and standard port models, these rugged, high pressure three piece valves are ideal for process, severe service, high temperature, and high cycle applications. Secure Mount: Triad Series valves offer ease of automation due to an integrally cast actuator mounting pad that complies with ISO 5211 standards through 2″ valve sizes. The three piece body design of the Triad Series offers many advantages, including installation flexibility, elimination of the need for two sets of flanges, and ease of in line and out of line servicing. These time-saving features are beneficial for process industries, automated valves and welded piping systems by reducing costly downtime. During maintenance, the actuator and accessories can remain mounted on the valve body. The entire valve and actuator assembly is easily reinstalled with no need for recalibration of the unit. In Line Servicing: To perform in line maintenance, remove the body bolts on opposing sides of the center body, loosen the 2 bolts at the top of the valve and swing the body up. The valve can swing to the left or right depending on which bolts are removed. All body components can be serviced in this position without disturbing the piping system. Out-of-Line Servicing: For complete removal of valve from the line, remove all body bolts, then lift the valve body out of the pipeline. The removed body can be serviced or replaced, then reinstalled without needing to realign the end connections or the piping system.